Clip and count Box Tops logos. Each box top is worth 10 cents. Proceeds support various programs at KDS Middle School such as library, technology, athletics, etc. AmazonSmile is a simple and automatic way for you to support KDS DAR School every time you shop, at no cost to you. When you shop at smile.amazon.com, you will find the exact same low prices, vast selection and convenient shopping experience as Amazon.com, with the added bonus that Amazon will donate a portion of the purchase price to KDS. To shop at AmazonSmile simply go to smile.amazon.com from the web browser on your computer or mobile device. On your first visit to AmazonSmile (smile.amazon.com), you need to select Kate Duncan Smith Daughters of the American Revolution School to receive donations from eligible purchases before you begin shopping. The site will remember your selection, and then every eligible purchase you make at smile.amazon.com will result in a donation. 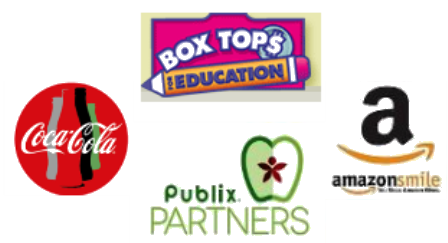 As of August 1, 2018, the Publix Partners swipe card will no longer work to make donations to your favorite school. Please follow the instructions below to continue supporting KDS every time you shop at Publix. Customers must sign up for a Publix.com account, then log in and select 'Kate Duncan Smith DAR School' under the My Publix Partner section. Then, every time you shop at Publix, provide the cashier with the phone number associated with your account to ensure your purchases benefit KDS and its students. It's that easy! Learn more at www.publix.com/partners, www.kdsdar.org, or by calling KDS at 256-728-4236. Used cell phones are no longer collected for the KDS recycling program. Collect empty inkjet and toner cartridges. Click here for a complete list of accepted cartridges and their values. Please do not send any items not on the list of accepted items to KDS nor to the recycling company. 20 or more qualifying cartridges may be shipped directly to the recycling company free of charge. Contact KDS Administration office for packing instructions and pre-paid UPS shipping labels. Proceeds support KDS classroom needs and student programs. Coca-Cola Give is the new destination for donating to the KDS Schools through collecting codes from The Coca-Cola products. Donations to the KDS Schools will be used to purchase supplies such as physical education, sports, technology, and arts at KDS. Go tous.coca-cola.com to sign up. Please do not ship Coke tops or codes from cartons to KDS. Schools are not authorized to have individual accounts, so all donations must originate from individual Coke.com accounts. Each logo is worth 24 cents. Help our school raise money all year long with Burgers for Better Schools™! It's free to join and easy to participate. All you have to do is become a Red Robin Royalty member, select our school, and Red Robin will donate 1% of all purchases you make at participating locations. Learn more at redrobin.com/betterschools.